The One Lovely Blog Award Goes To . . . Surprises are all around us – like the Petunia above. It appeared in a flowerpot that holds a Gerbera Daisy. You see, I didn’t plant this petunia – at least not this year. 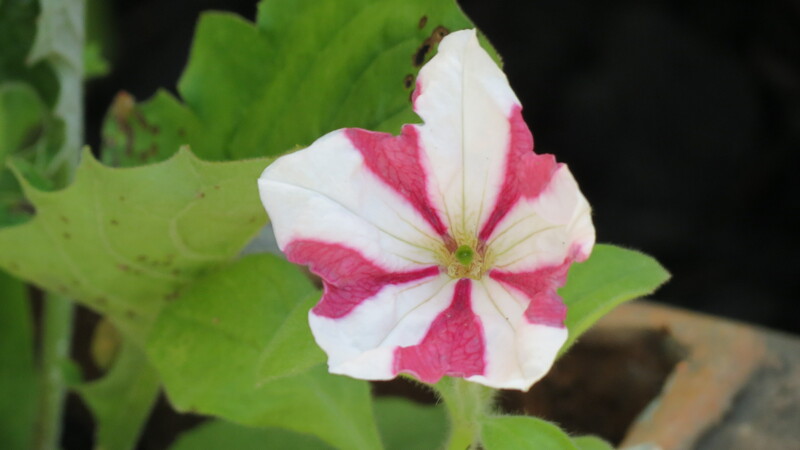 If my memory is correct, that color palette was planted a year or so ago – which means that a seed from that planting remained viable for that length of time, and now – surprise! That feeling – that thrill of receiving something so unexpected – is what it was like when I was contacted by Sara from Real Life Project to let me know she had nominated me for the One Lovely Blog Award and the Very Inspiring Blogger Award. Making this nomination extra-special is the fact that Sara is not a garden blogger. Instead she covers all topics important to new moms, from parenting to crafts, from wellness to recipes. And no matter what she addresses, Sara’s goal is to share her life and her process of achieving balance – a very impressive task that is handled with great care, humor, and grace. Since I have previously addressed the Very Inspiring Blogger Award in a previous post, I am going to concentrate on One Lovely Blog. Thank the nominator and link to his/her site. Check. Share seven things about myself. Give me a few moments to get my randomness in order, please. Nominate 10 other bloggers, let them know, and then link to their site from your own. All in good time, since I have an idea on how to address this one. I’ve recently learned that I have titanium in my head. About 15 years ago, I was in a car accident in which my only injury was a fractured skull (that could explain a lot). I had two surgeries to alleviate pressure, but it never occurred to me that my skull would have to be held in place with some hardware. Fast forward to a few weeks ago when I started getting sharp pains along the surgery site. A CAT scan revealed the metal plates and screws. The doctor says not to worry, but I have diagnosed myself. Ladies and gentlemen, this may not be a surprise to you (and it certainly wasn’t to Joe), but I have a screw loose. 2. I have a rotating list of celebrities who I would like to invite over for dinner. Some past guests have been Madonna (but I have too many of those loathsome hydrangeas in my yard), Oprah (I worried that she would monopolize the conversation), and President and Mrs. Obama (but they never responded to my invitation). My newest dinner guest would have to be Adele. 3. I am addicted to my iPad, especially the game “Farm Up.” Trust me: taking care of a virtual farm is hard work. 4. I cannot solve the Rubik’s Cube, which really has nothing to do with the previously mentioned head injury. 5. My all-time favorite board game is Risk. The problem is no one else liked or likes to play that game. The charm of playing all six colors has worn off over the years. My favorite Broadway show is Les Miserables – and to say that I am anxiously awaiting the December release of the film would be an understatement. If they have one of those midnight showings like they’ve done for the Twilight series and Harry Potter, I am so there – wearing a beret, of course. 7. An ideal Saturday for me when I was younger was watching television. “Land of the Lost” to start the day. Then “Soul Train” and “American Bandstand” by lunch time, followed by a mid-afternoon sci-fi classic like The Day of the Triffids. And to end the night, a “Star Trek” rerun and “Space 1999.” Is that the Geek Police knocking at my door? Photography by Joylene – I know this is a blog promoting a “business,” but when I visit it, it’s more like a blog promoting a life that is filled with talent, sensitivity, passion, and creativity. Vickie Szumigala Photo Blog – When I started this garden blog, it opened up a world of other blogging genres – especially photography blogs. And this site is one of the best – and there are lots of amazing photos of flowers, which I personally think make the best subjects. Breathe Lighter – The title alone is something we all need to learn to do. Read each of Debra’s post, and you will be greeted with warmth and a hug. Cathyann’s Studio – I had the pleasure of “meeting” Cathyann when she asked to paint my dog Murphy for a benefit. Her site offers so much of her work and talent – and I am impressed when anyone can take some tubes of color and freely create with some strokes. Outtakes on the Outskirts – Join Julie as she adjusts to rural life. Each post is filled with humor and honesty about her successes and fails – and always with a smile on her face. Gardenhood – Somehow, Cheryl is able to translate her sense of peace and tranquility into words and photos on her blog. It’s the perfect ending to a stress-filled day. Canoe Corner – Marguerite’s blog is a journey where she documents her adventure as she builds a new life on Canada’s east coast. It’s mesmerizing to watch the process and the changes that her dedication brings. Graphicality UK—I adore this site for so many reasons: honesty, creativity, inspiration – and Helene, the woman who is responsible for all that is graphical. Cindyricksger — Here is the blog of a fascinating woman who lives on an island in northern Lake Michigan. There, she lives, works, writes, and creates — with passion and honesty. Our Garden Journal – Cathy and Steve, the couple behind this blog, fascinate me. I love their enthusiasm and passion for gardening, life, and people. Their warmth is evident in every single post. Joy in the Moments – The title says it all. Char is the voice behind the blog, and she sees and celebrates the smallest joys that life offers. A true treasure! Now, I’m off to notify my nominees. In the meantime, I encourage you to click on the links and explore these wonderful sites – you just might be surprised, and there’s nothing wrong with that. Congratulations! And thank you for the nomination, too! You are very welcome and very deserving! Yeah, tell me about it! I haven’t had my head x-rayed, but you’re probably right…I do have a screw loose. Congratulations! And thank you so much for nominating me and for your kind words about my hobby! And also, welcome to the club of ‘titanium people’ 🙂 I have titanium in my neck, torso, back and hip…hey, I just got an idea for one of my random facts about myself, better leave the details for my post! 🙂 We titanium people have got to stick together! I hope the surprises keep on coming. Enjoy the day! Thank you so much for nominating us, Kevin. We’re delighted that you enjoy our blog and we’ll be sure to pass it on! You are very welcome — and I am totally impressed with your embracing life. And congratulations to YOU, for YOUR nomination for the award!! You’re very welcome — and best of luck with that spam nonsense. Congratulations, Kevin. I have yet to read a blogger so deserving. Reading each post, I feel as if taking part in a salon. I’m entertained, touched, charmed, and wowed in turns. That you should nominate me is just so flabbergastingly wonderful. Thank you. And for your kind words, as well. Fabulous facts and a cool surprise plant!I love that you have a screw loose. I wish I had such a great excuse. 🙂 I think Adele would be fabulous at dinner. She might even sing for her supper. 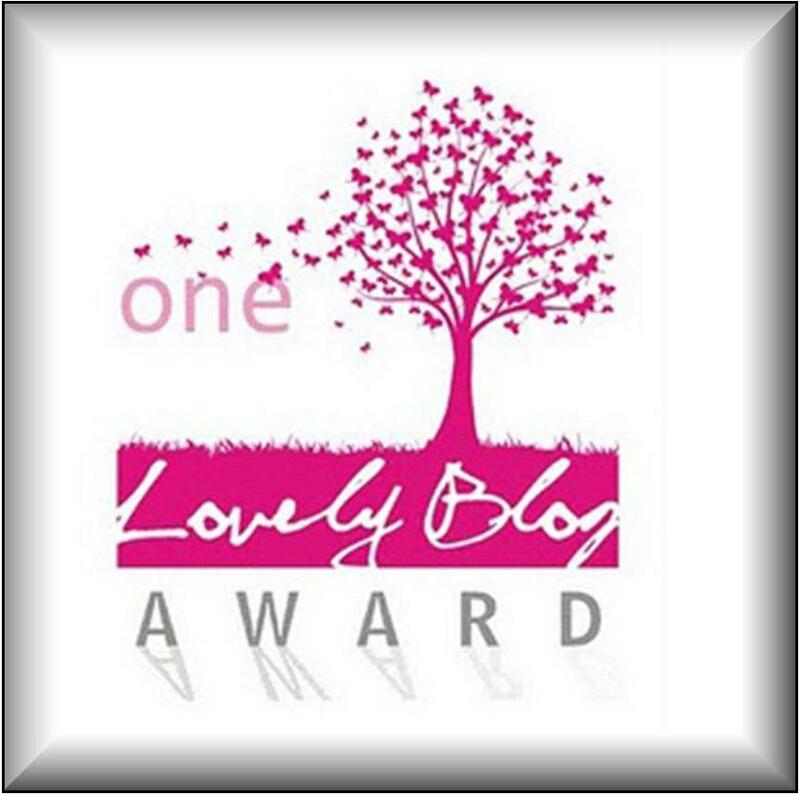 Congratulations on the One Lovely Blog award! Thank you so much Kevin, for the nomination! I am honored and am glad that you enjoy my blog as much as I enjoy yours! Many thanks — and one of the things I enjoy about your blog is the chance to see your passion in your work. Well done! I know these awards create a sort of stress. Take your times and have fun with it. Yes, in a way they do because you feel like you need to hurry and formulate your nomination, but they are still fun and an honor to receive and I can’t thank you enough for the recognition. Congrats on yet another well-deserved award! As for Risk, I’m sure a trip to VA would satisfy the need to play a few games – and you don’t have to bring your game with you. The boys down here are huge fans and frequently get Michael involved in a game! It was always a fave in the Merc. family! Once again, I sooooo enjoy the blog! Keep on writing! Congrats in store. You are very deserving and wildly entertaining. Congrats on your award. It’s nice to be appreciated. Bridget, many thanks. When the notification arrives, it’s always a thrill. Congratulations Kevin and thank you for the sweet mention of my blog. Thank goodness for loose screws, they make life so much more interesting. Congrats! 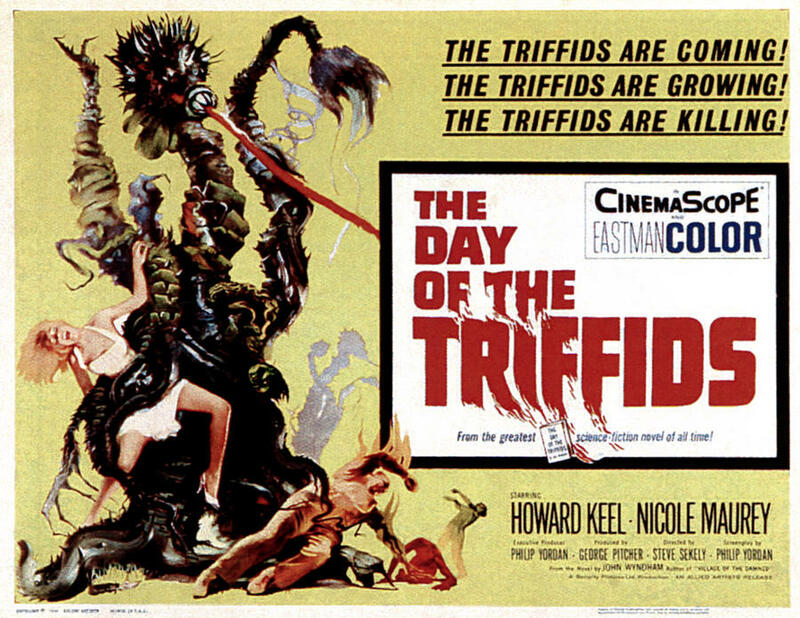 If u like day of the triffids you must know From Hell It Came! I have Risk issues. My older brothers used to let me play at my mom’s insistence, then they would take over my countries so they could play without me. Made me cry every time. Maybe that’s why I’m not very good at geography. Ouch! Your Risk tale reminds me of Monopoly games with my younger sister. I would always win, until she figured out that Park Place and Boardwalk were key purchases. Then, I turned to Risk.